Temporary Isolation Rooms and their Application to Hospital Surge Capacity for Infection Control – microBEnet: the microbiology of the Built Environment network. In the event of a disaster, hospitals must have plans in place for receiving a surge of patients with a variety of possible infectious diseases or conditions. Pandemic-causing infectious diseases, such as the viruses that caused the SARS (2003), H1N1 (2009), and EBOV (2014) outbreaks, pose a particular public health threat that must be mitigated through careful planning (Lurie et al., 2009; Mead et al., 2012; Frieden et al., 2014). Hospital surge capacity plans commonly include protocols for handling the various stages of crisis. For example, Hick et al. (2009) proposed three categories of hospital operating conditions during a surge: conventional conditions, in which normal operating conditions are maintained but hospital bed capacity and some services are strained; contingency conditions, in which functionally equivalent care is provided to patients even though services are overextended and capacity is overburdened (e.g. operating suites are converted into ICU’s); and crisis conditions, where hospitals must strive to provide only sufficient care considering circumstances where staff may be exhausted, a shortage of supplies could exist, and facility capacity is overwhelmed. Crisis conditions may include adopting triage practices and will require close coordination between many local health organizations for solving logistical issues like transporting patients, maintaining staff, and stocking and distributing supplies (Lurie et al., 2008; Hick et al., 2010). In the specific case of a large-scale pandemic or bioterrorism attack, hospitals must have the capability to isolate a surge of infectious patients from the public. Hospitals should be prepared for at least a 300-500% increase in ICU and isolation room capacity in the event of a surge (Rubinson et al., 2005). Portable anterooms and negative air machines can be used to construct temporary isolation spaces, and rooms with specialized ventilation conditions, like pre- and post-anesthesia suites and operating rooms, can house infectious patients to increase capacity if needed (Anderson et al., 2007; Hick et al., 2010). 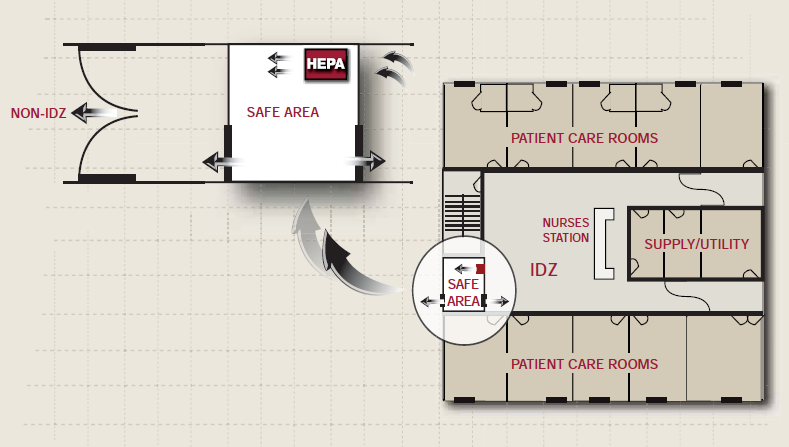 Infectious patients require negative pressure in their isolation room relative to the adjacent hallway, so that the direction of airflow is always into the isolation room. This limits the possibility of infectious particles generated by the patient escaping the room. Conversely, positively pressurized protective isolation rooms are needed when patients are immunocompromised, for example if many burn victims are among the patients of a surge or if patients have been exposed to radiation. When designing negative pressure isolation rooms, the American Institute of Architects (AIA) recommends the room be pressurized to -2.5 Pa relative to the adjacent hallway with 12 air changes per hour (ACH), of which 2 ACH must be outside air (Mead et al., 2012). The AIA also recommends that isolation room exhaust be directed outdoors and HEPA filtered if not released from an on-roof stack (Rosenbaum et al., 2004), though other disposal routes are also possible (e.g. Anderson et al., 2007). For protective positively-pressurized isolation rooms, the Centers for Disease Control and Prevention (CDC) recommends 12 ACH, HEPA filtered supply air, and more than 2.5 Pa of pressure, though 8 Pa is recommended (CDC, 2003). Active monitoring of the pressure differential between an isolation room the adjacent corridor is also recommended. Even though these recommendations are in place, studies of actual isolation room performance show that often these spaces operate with sub-optimal conditions. Saravia et al. (2007) demonstrated that 90% (n=560) of the hospital isolation rooms tested did not have the appropriate ventilation conditions to be used as an infectious isolation room. The long-term assessment of isolation room performance by Rice et al. (2001) demonstrated that isolation room operating conditions may shift away from optimal for a variety of reasons, and operating conditions are somewhat temporally variable. For example, a loose air handling unit fan belt and HVAC personnel accidentally moving a return damper during duct cleaning resulted in sharp changes in isolation room pressure during the Rice et al. assessment. Use of an anteroom is optional, but highly recommended, as a barrier between the isolation space and the rest of the hospital. The anteroom of a negative-pressure isolation room can be neutrally, positively, or negatively pressurized, depending on how the anteroom will be used and/or how infectious the pathogen being contained happens to be. Positive-pressure protective isolation rooms should always have negatively pressurized anterooms (Anderson et al., 2007). While there is no technical recommendation for anteroom pressures and flow rates, high air exchange rates in anterooms are recommended (ACH>~12), as increasing the rate of dilution will decrease the likelihood of particle escape (Anderson et al., 2007; Wiseman, 2003). 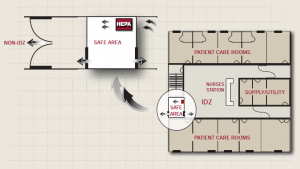 For infectious isolation rooms, a positively pressurized anteroom allows for personal protective equipment (PPE) to be put on in a protective environment prior to entering the isolation room. A drawback of this design is if infectious particles are able to reach the anteroom, from movements of the healthcare personnel for example (Hayden et al., 1998; Adams et al., 2011; Tang et al., 2013), they can be dispersed into the hospital. A negative pressure anteroom should be less pressurized than the isolation room so the flow of infectious particles is from the hallway, to the anteroom, to the isolation room. This arrangement is likely to provide improved physical isolation but may require a larger supply/exhaust flow differential in the isolation room to reach the appropriate pressure differential. Neutrally pressured anterooms only provide a physical barrier and ventilation-based dilution for infection control (Hyttinen et al., 2011). Donning of PPE in a neutral or negatively pressurized anteroom is not recommended. Isolation wards were historically used for long-term care of patients with communicable diseases such as tuberculosis. As infection control practices improved, the use of sanatoriums decreased through the middle of the 20th century in favor of treatment at general hospitals and home (Mead et al., 2012). In the event of a patient surge though, establishing a temporary isolation ward, like that shown in Figure 1, can be a solution for increasing isolation room capacity. To date, there are few studies testing the effectiveness of establishing temporary isolation wards during a surge. One published study, by Rosenbaum et al. (2004), demonstrated during a disaster preparedness drill at a hospital that multiple HEPA-filtered negative air machines placed in a physical therapy gymnasium can produce the recommended pressure and ACH for a negative-pressure isolation room. Prior to including the establishment of a temporary isolation ward in a hospital surge capacity plan, a successful full-scale demonstration should be performed to determine logistical and engineering issues that need to be addressed prior to plan adaptation. Adams, Noah J., Johnson, David L., Lynch, Robert A. 2011. The effect of pressure differential and care provider movement on airborne infectious isolation room containment effectiveness. American Journal of Infection Control 39(2), 91-97. Anderson, Jeanne, Geeslin, Andrew, Streifel, Andrew, Minnesota Department of Health. 2007. Airborne Infectious Disease Management: Methods for Temporary Negative Pressure Isolation. Office of Emergency Preparedness, Minnesota Department of Health. CDC, 2003. Guidelines for Environmental Infection Control in Health-Care Facilities: Recommendations of CDC and the Healthcare Infection Control Practices Advisory Committee (HICPAC). U.S. Department of Health and Human Services, Centers for Disease Control and Prevention (CDC), Atlanta GA.
Frieden, Thomas R., Damon, Inger, Bell, Beth P., Kenyon, Thomas, Nichol, Stuart. 2014. Ebola 2014 — New Challenges, New Global Response and Responsibility. The New England Journal of Medicine: Perspective, 1-3. Hayden, Charles S II, Johnston, Ova E., Hughes, Robert T., Jensen, Paul A. 1998. Air Volume Migration from Negative Pressure Isolation Rooms During Entry/Exit. Applied Occupational and Environmental Hygiene 13(7), 518-527. Hick, John L., Barbera, Joseph A., Kelen, Gabor D. 2009. Refining Surge Capacity: Conventional, Contingency, and Crisis Capacity. Disaster Medicine and Public Health Preparedness, 3(Suppl 1), S59-S67. Hick, John L., Christian, Michael D., Sprung, Charles L. 2010. Chapter 2. Surge capacity and infrastructure considerations for mass critical care. Intensive Care Medicine, 36(Suppl 1), S11-S20. Hyttinen, Marko, Rautio, Anna, Pasanen, Pertti, Reponen, Tiina, Earnest, G. Scott, Steifel, Andrew, Kalliokoski, Pentti. 2011. Airborne Infection Isolation Rooms — A Review of Experimental Studies. Indoor and Built Environment 20(6), 584-594. Lurie, Nicole, Dausey, David J., Knighton, Troy, Moore, Melinda, Zakowski, Sarah, Deyton, Lawrence. 2008. Community Planning for Pandemic Influenza: Lessons from the VA Health Care System. Disaster Medicine and Public Health Preparedness 2, 251-257. Lurie, Nicole. 2009. H1N1 Influenza, Public Health Preparedness, and Health Care Reform. The New England Journal of Medicine 361(9), 843-845. Mead, Kenneth R., Feng, Amy, Hammond, Duane, Shulman, Stan. 2012. Expedient Methods for Surge Airborne Isolation within Healthcare Settings during Response to a Natural or Manmade Epidemic. Division of Applied Research and Technology, Engineering and Physical Hazards Branch, EPHB Report No. 301-05f. Department of Health and Human Services, Centers for Disease Control and Prevention and the National Institute for Occupational Safety and Health. Rice, Nancy, Streifel, Andrew, Vesley, Donald. 2001. An Evaluation of Hospital Special-Ventilation-Room Pressures. Infection Control and Hospital Epidemiology 22(1), 19-23. Rosenbaum, Robert A., Benyo, Jeffrey S., O’Connor, Robert E., Passarello, Brent A., Williams, Daniel R., Humphrey, Brian D., Ross, Robert W., Berry, James M., Krebs, Jeffrey G. 2004. Use of a Portable Forced Air System to Convert Existing Hospital Space into a Mass Casualty Isolation Area. Annals of Emergency Medicine 44(6), 628-634. Rubinson, Lewis, Nuzzo, Jennifer B., Talmor, Daniel S., O’Toole, Tara, Kramer, Bradley R., Inglesby, Thomas V., the Working Group on Emergency Mass Critical Care. 2005. Augmentation of hospital critical care capacity after bioterrorist attacks or epidemics: Recommendations of the Working Group on Emergency Mass Critical Care. Critical Care Medicine, 33(10), 2393-2403. Saravia, Stefan A., Raynor, Peter C., Streifel, Andrew J. 2007. A performance assessment of airborne infection isolation rooms. American Journal of Infection Control 35(5), 324-331. Tang, Julian W., Nicolle, Andre, Pantelic, Jovan, Klettner, Christian A., Su, Ruikun, Kalliomaki, Petri, Saarinen, Pekka, Koskela, Hannu, Reijula, Kari, Mustakallio, Panu, Cheong, David K.W., Sekhar, Chandra, Tham, Kwok Wai. 2013. Different Types of Door-Opening Motions as Contributing Factors to Containment Failures in Hospital Isolation Rooms. PLoS One 8(6), e66663. Wiseman, Brian. 2003. Room Pressure for Critical Environments. ASHRAE Journal, February, 35-39. What is the knowledge base for the potential for airborne transmission of Ebola? C. J. Peters and J. W. LeDuc. Journal of Infectious Diseases 1999;179 (Suppl 1).